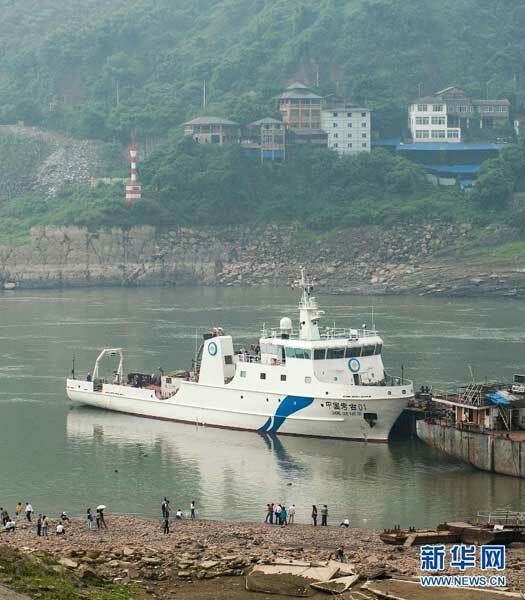 China's first underwater archaeological exploration vessel has begun testing in southwest China's Chongqing Municipality. The ship, owned by China's cultural heritage team, is berthed at the private port of Changhang Dongfeng Shipbuilding Corporation. The hull of the ship is white, emblazoned with "Chinese Archeology" both in Chinese and English. The 500-tonne, 56-meter vessel has a maximum displacement of 960 tonnes, and can carry a crew of 30, according to an official with the Chongqing culture and heritage commission. Underwater archaeology in China has made great strides since the 1980s and a number of professional institutions and teams work in the field. The lack of properly equipped vessels ships has long been a problem. This ship, designed by the 701 Research Institute of the China Shipbuilding Industry Corporation, will continue testing in Shanghai before sailing out to the Xisha Islands in the South China Sea to begin archaeology work.